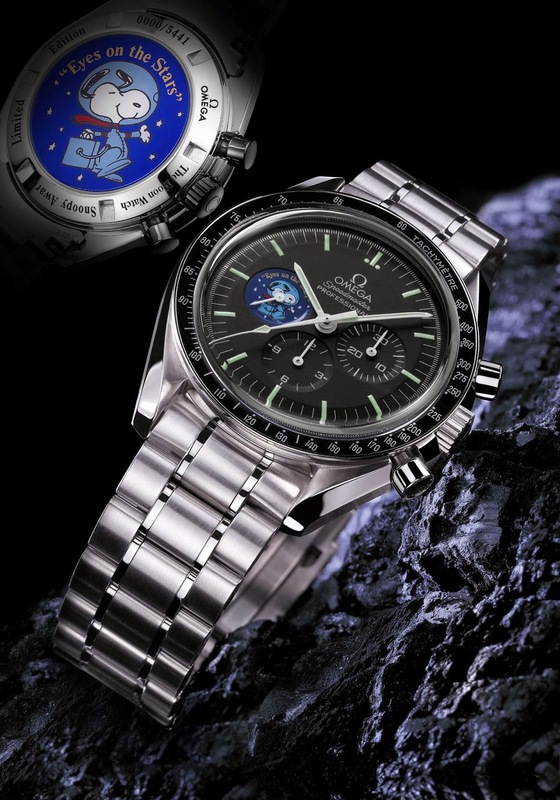 Launched in 2003, the Speedmaster Professional Snoopy Edition model celebrates OMEGA’s achievement of winning the Snoopy Award on 5 October 1970 in recognition of the crucial role that its Speedmaster chronograph played on the Apollo 13 mission. 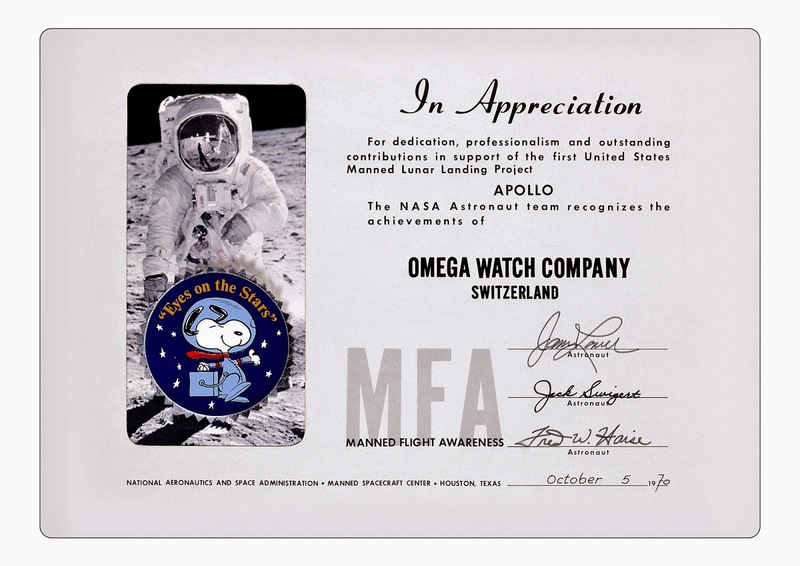 Snoopy was the watchdog for NASA’s prestigious manned flight awareness award and has been awarded to both to individuals and companies for outstanding efforts that contribute to the success of human space flight missions. The coveted award comprises a sterling silver pin, which has flown aboard the Space Shuttle, in the form of Snoopy wearing a space helmet and space suit. Recipients are also presented with a certificate and a letter of commendation, personally signed by an astronaut, citing the astronauts’ appreciation of their outstanding performance. Apollo 13 was to have been the third mission to land on the Moon, but an explosion in one of the oxygen tanks crippled the spacecraft during flight and the crew were forced to orbit the Moon to place the spacecraft on a free-return trajectory which would take them back to Earth. In order to conserve power for the return to Earth, the module was powered down except for environmental control. 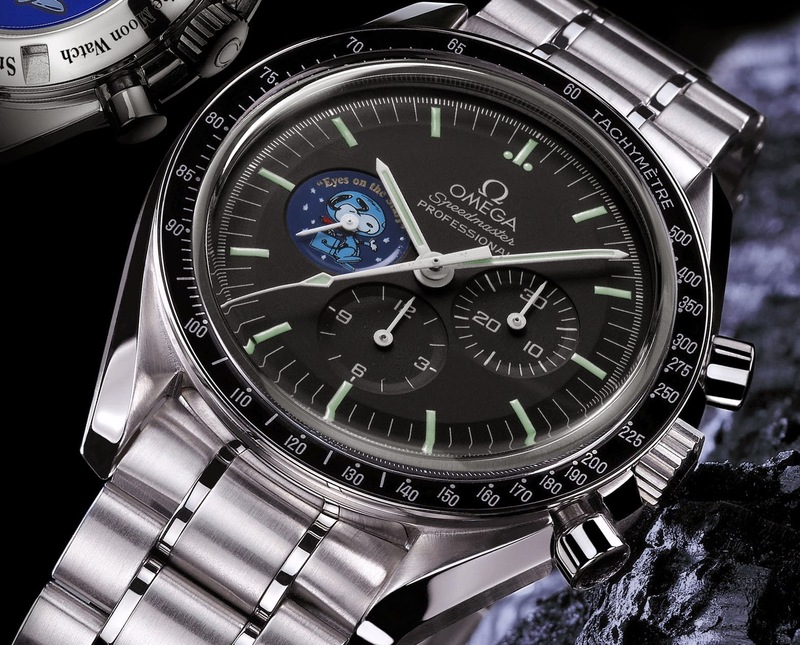 As such, the only functioning timing device on board was the OMEGA Speedmaster, which the crew relied on to perform two operations: firstly to time ignition of the rockets to shorten the estimated length of the return to Earth and secondly to time ignition of the rockets to decrease speed and raise the flight path angle for re-entry into the Earth’s atmosphere. This second operation was crucial, since any mistake in the timing could have led to an incorrect entry angle and, as a result, potential disaster for the crew. The classic Moon Watch retains the same look it had at the time of the Apollo programme – a polished stainless steel case with tapered and facetted lugs, steel bezel with black aluminium ring and tachometer scale and hesalite crystal. The matt black dial is also typical of the Speedmaster, together with the luminous hands and hour markers and 1/5th of a second graduations for the chronograph. The Speedmaster also has a screw-in case back that ensures it is water resistant to 30 metres. The movement in this special edition Speedmaster Professional is OMEGA calibre 1861 a manual-winding chronograph movement with a power reserve of 45 hours. The hand-wound movement is perfect for use in outer space, since, unlike self-winding movements, it does not rely on the force of gravity (absent in the vacuum of space) for winding. The OMEGA calibre 1861 is an advanced version of the original calibre 861, one of the masterpieces in watchmaking history. The limited-edition Snoopy Award version has the award patch inset in colour into the continuous seconds counter at 9 o’clock on the dial. 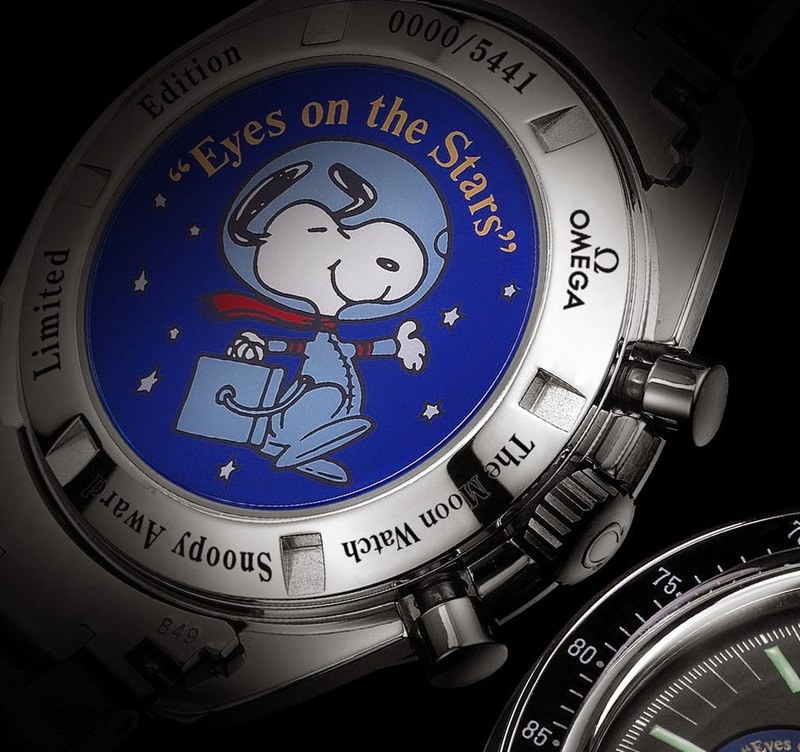 The same colourful design, with its “Eyes on the Stars” motto, is reproduced on the watch’s special case back. A striking effect is achieved by both etching and painting the emblem on to a sapphire crystal case back, which adds an extra dimension to the colours against the light. The Snoopy edition Speedmaster Professional featuring stainless steel case and stainless steel bracelet was produced in a limited edition of 5441 numbered pieces, with the unusual number reflecting the elapsed time of the Apollo 13 mission: 142 hours, 54 minutes and 41 seconds.